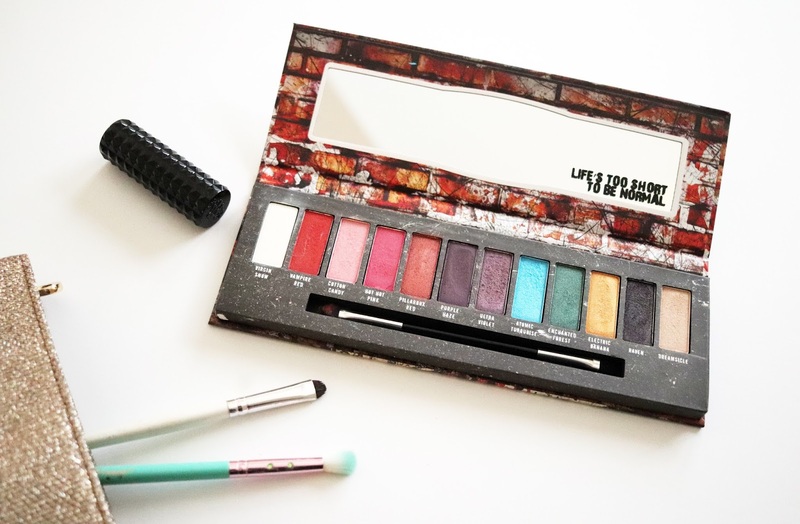 In celebration of their 40th anniversary, Manic Panic collaborated with Hot Topic to release an eyeshadow palette with 12 shades inspired by their iconic range of hair dye. I love Manic Panic, I love Hot Topic, and I love eyeshadow palettes-- I was doomed from the second that I heard about this. Okay, "doomed" is a bit dramatic since this palette only costs $11.90 at Hot Topic, plus they are pretty much always running some sort of promotion, so I got it for only $8.92. Manic Panic has been selling cosmetics other than hair dye for quite a while, but I've never tried them. I wasn't sure what to except from this collaboration. I trust Manic Panic's hair dye and I've never been let down by my clothing purchases from Hot Topic, but I've heard very mixed opinions on Hot Topic's cosmetics, so I've avoided them. Until now. It wasn't until after I had purchased it that I saw these videos on Manic Panic's Instagram and I started getting a little more excited for it. It's bigger than I thought it would be and it reminds me of Urban Decay's Full Spectrum palette, but smaller. 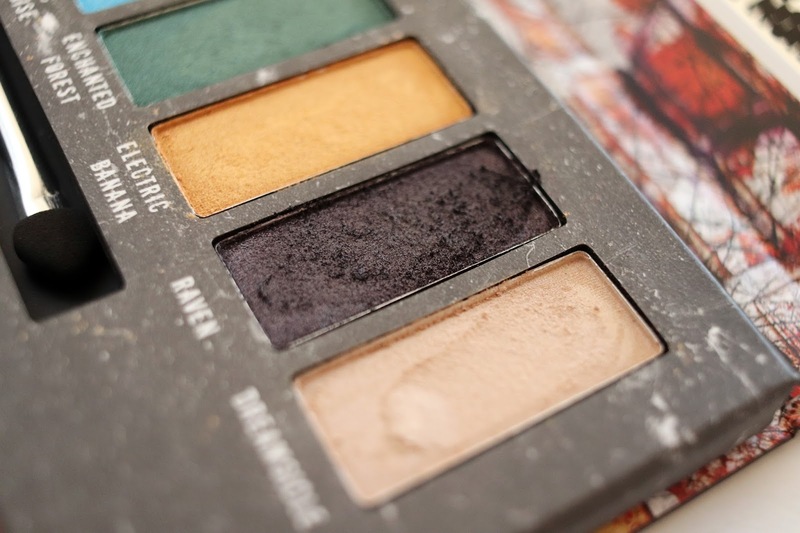 Like all of Manic Panic's products, this palette is vegan and cruelty free. The packaging is cardboard and the front has an image of the bathroom wall inside the famous but now-defunct New York City rock club, CBGB. There is a mirror inside and it comes with a double-ended smudge brush and sponge applicator, which isn't great but I wouldn't expect anything more from a $12 palette. The initial finger swatching was disappointing. The shades came out a bit chunky and chalky. Some of the shades, especially Virgin Snow (white, the only matte shade), were very difficult to even get on my finger. The first time that I used this palette on my eyes I used an e.l.f. smudge brush and an e.l.f. eyeshadow brush to apply the shadows, they're my favorite brushes for packing on color and they only cost $1 each. I put Virgin Snow all over my lids without primer or any sort of base and it was actually pretty pigmented. Not the most pigmented, but pretty good and better than I was expecting after the unsuccessful finger swatch. I layered Atomic Turquoise and Enchanted Forest over it and I was impressed. They were so pigmented and blended pretty well, except they had a lot of fallout. But overall, the shadows looked very pretty and vibrant. After the first use, I was so excited to use this palette again. I continued using this palette over a couple weeks and always got the same results as I did the first time I used it. This palette really is quite pigmented and the colors blend well, but the fallout situation is a bit much. 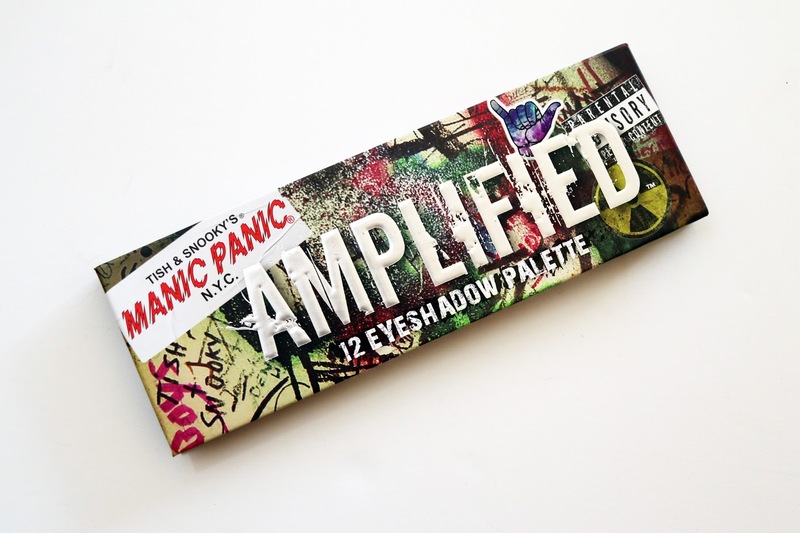 I would prefer there to be more matte shades in this palette, but hey, Manic Panic isn't about being subtle. It also feels a bit incomplete without a Rockabilly Blue (cobalt) and Electric Lizard (lime green)-- but I may feel that way since those are two of my absolute favorite Manic Panic shades. I would recommend the use of an eyelid primer or bright white cream base with these shadows to help keep them in place and appear more vibrant. NYX's Eyeshadow Base and NYX's Jumbo Eye Pencil in Milk are affordable options that I love. Also, be sure to use whatever method you prefer for dealing with fallout-- I keep it simple and just hold a piece of tissue under my eye. If you're on a tight budget and you want to incorporate some bright colors into your look, this could be a great palette for you. 12 shadows for $12 (or less) isn't bad at all! Despite the fallout, it really is a great palette, especially for the price. You can get this palette from Hot Topic or Manic Panic.